Bell Diamond Manor in Norfolk, VA, earned EarthCraft Multifamily Gold after $14 million rehabilitation by Woda Cooper Companies, Inc.
January 31, 2019, Norfolk, VA…Woda Cooper Companies, Inc. (Woda Cooper) announced today that Bell Diamond Manor has earned the EarthCraft Multifamily Gold Certification from Viridiant, a third-party, non-profit organization that oversees sustainability certification programs in Virginia. Last year, Woda Cooper re-opened Bell Diamond Manor, a 128-unit affordable townhouse and garden apartment community in the Berkley neighborhood of Norfolk, VA,after a $14 million, top-to-bottom renovation. The EarthCraft Multifamily Gold certificate lists ten different selection criteria used to measure Bell Diamond Manor and its sustainability features. The property earned high ranking points for improvements in energy efficiency systems, water efficiency, indoor air quality, high performance building envelope, site planning, construction waste management, resource efficiency, durability and moisture management, education and operations, and general innovation. Bell Diamond Manor was in need of major repairs and renovations. It was first established by Beacon Light Civic League in the early 1970s under the leadership of Mr. George Banks who is credited as a champion of affordable housing and hero of the Berkley community. Beacon Light Civic League owned and operated Bell Diamond Manor until turning to Woda Cooper to lead the recent redevelopment. Improvements at Bell Diamond Manor included the replacement of all roofs, windows, siding, and doors. In addition, the two- and three-bedroom units have new cabinetry, painting, wood trim, flooring, low-energy HVAC systems, updated bathrooms, and Energy Star appliances for improved energy efficiency. Sixteen units were redesigned for full handicap accessibility. Woda Cooper also added new community space, lighting, two new playgrounds, and expanded the onsite management office. “Bell Diamond Manor provides high quality, attractive rental homes for working families, retirees, and others who need affordable housing, and we have ensured they will enjoy low monthly utility costs and ongoing comfort because of the property’s excellent energy efficiency features,” said Bruce Watts, Vice President-Development for Woda Cooper Companies, Inc. The renovations at Bell Diamond Manor were made possible through the allocation of housing tax credits by the Virginia Housing Development Authority with the housing tax credit investment and a FHA 221(d)4 loan for permanent debt by Bank of America. Thirty-five units receive project-based Section 8 rental assistance through the US Department of Housing and Urban Development in conjunction with the Norfolk Redevelopment and Housing Authority. Bell Diamond Manor offers a high-quality, safe, and lifestyle oriented housing option that is affordable for seniors, workforce singles and families earning up to 60% AMI. Woda Cooper Companies, Inc. and its affiliates are experienced developers, general contractors, and property managers specializing in the design, construction, and management of affordable multi-family apartments, senior communities, and single-family homes. Considered leading experts in the affordable housing industry, the Woda Cooper team is known for producing and maintaining high quality affordable housing. Affordable Housing Finance ranked the firm 6th overall among Developers and 29nth overall among Owners in its April/May 2018 issue. Woda Cooper Companies, Inc. has developed and currently manages more than 300 communities and 12,000 units, operating in 15 states. In addition to its Columbus headquarters, the firm has offices in Savannah, GA; Indianapolis, Indiana; Shelbyville, Kentucky; Annapolis, Maryland; Mackinaw City, Michigan; Charlotte, North Carolina; and Norfolk, Virginia. For more information, call (614) 396-3200 or visit www.wodagroup.com. Viridiant is a non-profit organization committed to supporting sustainable building processes through education, consultation and certification. Through these efforts, Viridiant helps to set a path for builders, developers, and homeowners to create structures that are more affordable, more livable and more durable. Learn more at viridiant.org. The EarthCraft program was created in 1999 by a partnership between Southface Energy Institute and the Greater Atlanta Home Builders Association and was brought to Virginia in 2006. Operated by Viridiant in Virginia, Washington DC and Maryland, EarthCraft is a family of green building certification programs designed to address climate, energy and water issues unique to the southeastern United States. 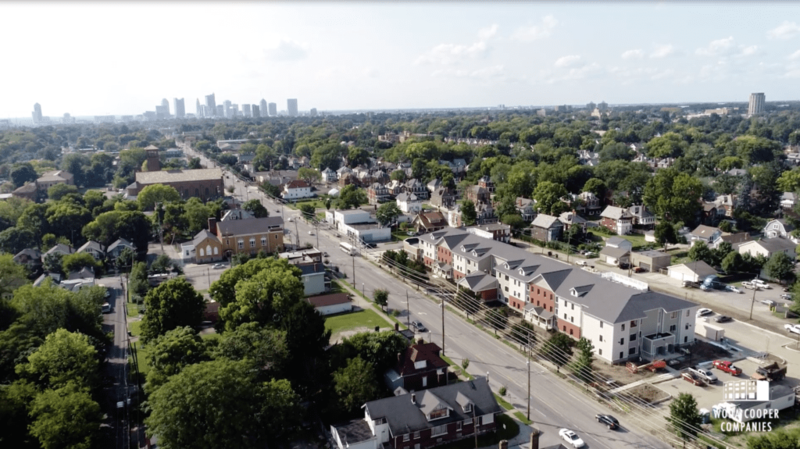 The program serves as a blueprint for energy and resource-efficient single-family homes, multifamily structures, renovation projects, community developments, light commercial buildings and sustainable preservation projects. Bell Diamond Manor is a 128-unit affordable townhouse and garden apartment community in the Berkley neighborhood of Norfolk, VA. The redevelopment included a new community center (above), new playground areas plus substantial rehabilitation to all apartments. Two and three bedroom townhouses were rehabilitated with new roofs, siding, windows and doors plus complete rehabilitation of interiors. They feature private entrances and patios. Garden apartments were also rehabilitated throughout with new siding, roofs, doors, windows and complete renovations to interiors. All units have new cabinetry, painting, wood trim, flooring, low-energy HVAC systems, updated bathrooms, and Energy Star appliances. Sixteen units were redesigned for full handicap accessibility.